It is easy to add color to a garden for summer color and each spring blossoms on trees provide interest. Winter is a little more challenging even though the Atlanta winters are far less severe than those in the north. The trick for winter interest is to look for trees and shrubs that have winter blooming periods or have interesting features like peeling or colored bark and berries. 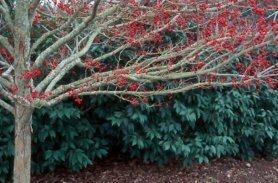 As most winter features on trees and shrubs are less showy than spring blossoms, placement of these items should be considered. The small scented blossom on witchhazels are great in midwinter, but will be appreciated all the more if you provide a footpath close by. Peeling bark on trees and shrubs can look terrific in midwinter. Crape Myrtle varieties that have cinnamon bark are perhaps some of the most appealing small trees that grow well in Atlanta. Peeling bark can also be found on River Birches, Oak Leaf Hydrangeas and Sycamore trees. Colored bark on shrubs can be attractive particularly if offset by a contrasting color. In the north this would be snow cover, but as snow in Atlanta is uncommon, try to provide a contrasting color with a small wall or shrubs such as blue spruce or yellow cypress. Dogwoods have both a bright yellow twig and a vibrant red twig version that are best in the first year’s growth. Prune both these shrubs each year to encourage the continuation of colored twigs each successive winter. Winter blooming shrubs are rather rare but witchhazels are one of the best known. The orange or yellow flowers arrive in December or January, depending on species. Some varieties have scent as well, so if this is important to you, make sure you research the variety and cultivar well. Lorepetulums also bloom early in the year and have a form that is similar to witchhazels. Both these shrubs grow in part sun. Camellias also bloom in winter. Starting in late October or early November, there are cultivars that bloom in December through March. These typical southern beauties are evergreen and make excellent foundation plantings. To see how varied these cultivars can be, take a trip east, from Atlanta, to the State Botanical Garden in Athens where you will see mature species in full bloom each winter. Similar to camellias, and blooming just a little later is the borderline hardy rapheolus. These pretty shrubs are more common in the southern part of Georgia, but will grow in Greater Atlanta too. February is the time to look for the pretty Star Magnolia as well. The pure white flowers of this small tree appear before the leaves and arrive about the same time as most daffodils. Berries that persist throughout the winter months are a bonus to both gardeners and birds. The most famous winter berry is Holly which is starred in many holiday arrangements. Holly though is not the only berry that occurs at this time though. The bright iridescent purple berries of the Callicarpa are stunning. This pretty open shrub is small and can be grown in almost any garden if given some shade from the hot afternoon sun. Berries of a sort can also be seen on Pieris japonica. These are not true berries but pre-flowers that start to form each fall, and are protected in a wax-like shell over the winter. Both Pieris and callicarpa berries work well on winter wreaths as well. No winter landscape would be complete without a mention of grasses. There are many varieties of perennial grasses that take on an attractive look each winter. They provide seeds for birds, and many look like a cloud of gold or purple when the winter sun shines on, and through, them. So even though winters in Atlanta are not as long or as wickedly cold as they are in the north, they can still be brightened by some smart landscape choices. If you plant for this season, take the time to plant things where they can be seen from a favorite window, or near a pathway, so that they can be appreciated at their best. With a succession of blooms and berries, winter will become another great season in your garden.